Ward Noble Adkins, Sr., and John August Adkins, Sr.
Irvin Capers Lord, former Houston Mayor. Image available on the Internet and included in accordance with Title 17 U.S.C. Section 107. LORD, IRVIN CAPERS (1827–1914). 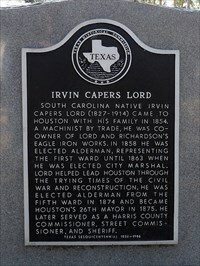 Irvin Capers Lord (known by his initials I. C.) served as mayor of the city of Houston in 1875–76 and in many other public offices during fifty years of public service in Houston and Harris County. He was the son of Jacob Nathaniel Lord and Mary Elizabeth (Tarbox) Lord and was born in Charleston, South Carolina, on November 29, 1827. Lord married Emmeline Seddons in 1848 in Charleston, but moved his family to Houston in 1854 to escape the yellow fever disease that imperiled many areas of South Carolina. The fever’s victims included children of the couple. In 1858 Lord was elected to his first public office in Houston as alderman for the First Ward. Later elective positions included alderman for the Fifth Ward, city marshal, Harris County sheriff, and Harris County commissioner. He also held numerous appointive positions in Houston’s local government. Lord was a political supporter of Sam Houston and in 1861 named his youngest son Sam Houston Lord. Main Street during Reconstruction in the 1870s, Houston. Image available on the Internet and included in accordance with Title 17 U.S.C. Section 107. As the twenty-sixth mayor of Houston, Lord helped lead the city through the trying times of Reconstruction following the Civil War. The city faced serious challenges involving municipal finance, public safety, and political instability. During his service as mayor, Lord oversaw numerous public works projects in his administration, including the rebuilding of the city hall and Market House and the paving of several downtown streets. During his service in law enforcement, it was Lord’s proudest boast that he never carried a gun while acting as a peace officer. I. C. Lord owned a sawmill business along the Houston East and West Texas Railway, where the City of Lord developed and was named after him in 1883. Image available on the Internet and included in accordance with Title 17 U.S.C. Section 107. Lord’s business interests included Lord & Richardson’s Eagle Iron Works, a company best-known for manufacturing products made of iron and brass in Houston. Early city directories also described Lord as a machinist, blacksmith, sawmill owner, and lumber dealer. In his spare time he appeared in several local productions of Shakespeare’s plays. Lord’s first home in Houston was located near Market Square downtown on what later became the site of the Cotton Exchange Building. In 1858 he moved his family to the First Ward (later subdivided into the Fifth Ward, north of downtown Houston), where they lived for more than forty-five years. He spent his final years with his daughter Dora in the newly-developed Montrose neighborhood south of downtown. Irvin Capers Lord Historical Marker at Glenwood Cemetery, Houston. Image available on the Internet and included in accordance with Title 17 U.S.C. Section 107. When Lord died on September 22, 1914, his obituary stated that he was “one of the City’s oldest citizens, having filled every office within the gift of the people of Houston.” He is buried with his wife and several family members in Houston’s Glenwood Cemetery. Lord was survived by three of his sixteen children—his daughters Mary Elizabeth (“Mollie”) Lord Noble and Dora Lord, and his son Sam Lord. His pallbearers included then-current mayor Ben Campbell and several former mayors of Houston. Through his public service, I. C. Lord helped lead the city of Houston during its rapid growth from a small village of 3,000 residents in 1854 to one of the largest cities in the South. A Texas Historical Marker was dedicated in his honor at Glenwood Cemetery in 1987. Grace Noble Adkins Papers, Junior League Collection, Houston Metropolitan Research Center, Houston Public Library. Marj Gurasich, History of Harris County Sheriff’s Department 1837–1983 (Houston: Harris County Sheriff’s Deputies’ Association, 1983). Margaret S. Henson, Houston city officials, Harris County officials, 1837–1975, and volunteer fire company officers to 1894; includes index of 1,397 names (S.l. : Southwest Center for Urban Research, 1976). Historical Marker Files, Texas Historical Commission Library, Austin. Brent H. Holcomb, Marriage and Death Notices from The (Charleston) Times, 1800-1821 (Baltimore, Maryland: Geneaological Publishing Co., 1979). Houston Daily Post, September 23, 1914. Houston Daily Telegraph, January 9, 1877. Dr. S. O. Young, True Stories of Old Houston and Houstonians (Galveston: Oscar Springer, Publisher, 1913). Handbook of Texas Online, Ward Noble Adkins, Sr., and John August Adkins, Sr., "LORD, IRVIN CAPERS ," accessed April 26, 2019, http://www.tshaonline.org/handbook/online/articles/flo89. Uploaded on July 26, 2013. Modified on May 16, 2017. Published by the Texas State Historical Association.